We all live in an interconnected world and for business leaders the last decade has seen a dramatic rise in the speed and scale of this interdependence. But while increased connectivity is inevitable, increased collaboration is not. To succeed in today’s environment, leaders need to be able to build relationships, handle conflict and to share control in order to promote effective collaboration where it is needed most. 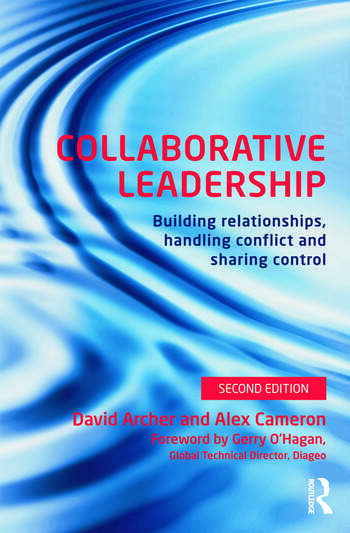 Archer and Cameron have been working in this field for over 10 years and were amongst the first business authors to define and explain Collaborative Leadership in their 2008 book. This 2nd edition draws on interviews, examples and additional cases studies of the new collaboration challenges that leaders face such as; working together to deal with the consequences of financial contagion in the Eurozone or elsewhere, responding to the growth in use of social networks by their staff and customers, and managing global supply chains to reach new growth markets. This fully revised, updated and re-structured text provides an easily accessible ‘how-to’ guide for leaders in today’s interconnected world. It will give both experienced and aspiring leaders the techniques and confidence to manage complex collaborative relationships in a sustainable way. It also acts as a guide for leadership development professionals, coaches and consultants who have to build leadership and collaboration capability within organizations. David Archer and Alex Cameron are founding Directors of Socia Ltd, a company which has an international reputation advising leaders of large organizations on how to get more from their business critical relationships. Their clients include leaders from sectors such as central government, transport, oil & gas and finance who face particularly significant collaboration challenges.